By Alexis Leon, Artech House , 2005. 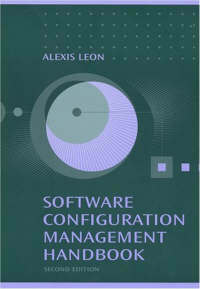 This is the second edition of my book "A Guide to Software Configuration Management" that was published in 2000. In 1999, when I started out to write the first edition of this book (A Guide to Software Configuration Management), my objective was to write a simple, easy-to-read and jargon free book on SCM covering the basic concepts. The idea was to get the reader as quickly up-to-speed on the basics and key issues as possible. Since the publication of the first edition of the book in May 2000, I have got a number of suggestions, questions, and comments from readers all around the world. From those mails and from my own research, I have found out what features of the book were liked, what were the points that needed improvement, in which areas more material and more coverage were required, what other areas needed to be covered and the like. Consequently, I set my goals higher for the second edition. My objective was to produce a revised, updated and comprehensive book on SCM while maintaining all the good aspects of the first edition. I wanted to write a book that will help the readers understand the SCM fundamentals and then to master the advanced topics as they advance in their careers. So the goal was to produce a book that started with the basics, explained the fundamentals and then took the readers to advanced topics—a complete reference. Because of the change in the scope and magnitude of the book it was decided to rename the book as Software Configuration Management Handbook (Second Edition).